The Centre for Life approach to hypnotherapy training focuses on the ‘whole person’, that is the physical, emotional and spiritual attributes along with the person as an energetic entity. We would like to invite you to The Centre for Life and both the foundation level and the diploma course in holistic hypnotherapy. As the trainers of this exciting and life-transforming course we are absolutely passionate about hypnotherapy as a non-invasive and extremely effective holistic healing modality for everyone. Our training combines a wonderful blend of talks, demonstrations and practice sessions (usually done in trios, so that there is one student as the therapist, one as the client and one as an observer). It has been our experience that the observer role is crucial to the learning function allowing the student to see first-hand how different individuals perform and respond. Each of the three, five day modules will layer a new level of practical experience so that by completion of the course the student will feel comfortable and highly confident to start seeing clients. This course offers the freedom to experience first-hand personal transformations that you can then relay to your future clients. People from diverse walks of life train as hypnotherapists and therefore offer a range of options for people seeking help. Clients are drawn to therapists that they resonate and can build a sense of rapport with. Therefore it doesn’t matter whether your background is in engineering, accounting, office management, gardening or nursing for example. Those of you that have raised families and are parents most often have wonderful skills that can be utilized as a therapist. At The Centre for Life we do not require any previous experience of therapy work or any kind of medical background to attend the Holistic Hypnotherapy Diploma training. We are looking for people who have a passion and desire to assist in the transformation of people’s experience of life. Desirable traits and attitudes for becoming a successful hypnotherapist are high levels of empathy, optimism, understanding, curiosity and motivation for positive change and a non-judgmental approach to the life challenges of others. One of your roles will be to assist your clients to discover the strengths and qualities that they already have within themselves that may have been hidden or denied. As one of our students we will be teaching you the required skills to build your confidence and experience, advising you of where to access additional resources as you will be asked to take responsibility for a portion of your own learning, complete assignments and hand them in to us on time so that they can be marked prior to the commencement of subsequent modules. Therefore you will need to be self-motivated and willing to prioritize your studies and course work despite potential distractions in your life. We also ask that each student takes responsibility for any of their own personal unfinished business to work on triggers via the use of hypnosis to release and transform them. This is very important and at an energetic level may affect your therapy business becoming a success. We will be able to assist you in identifying what may need to be worked through either in course hypnosis sessions, with a colleague or with a qualified therapist. There will be academic and theoretical work during the course that most people will find interesting, exciting and stimulating; you will need a level of willingness to learn and an open mind to new information which will allow for the perfect attitude to embark on this new career. We will ask you to fill in your application/ booking form and you may be asked to have a Skype or phone interview with one of the tutors if we have any questions regarding your eligibility. We want to ensure that hypnotherapy is the optimum career for you if you are going to invest your time and resources into this kind of studying. We also want to check that we offer the course that most resonates with your needs, beliefs and personality. If you are emotionally mature and balanced enough to work with a wide range of clients without being unduly affected yourself. Are you able to work with potentially vulnerable clients and manage their expectations? You will need to fill in our health assessment and declaration form. Certain medical conditions are contra-indicated for hypnosis. Are you willing and able to meet the academic requirements of the course? We are very happy to answer any of your questions and discuss any considerations you might have. The Diploma in Holistic Hypnotherapy offered by The Centre for Life has been assessed and accredited at practitioner level by the General Hypnotherapy Standards Council (UK). Graduates from this course are eligible for professional registration with the General Hypnotherapy Register (the GHSC's Registering Agency) at full practitioner status, together with the acquisition of the industry-based award - the General Qualification in Hypnotherapy Practice (GQHP). The Holistic Hypnotherapy training is run in three modules of five days, 15 days classroom and practical tuition time, total 120+ hours of class room based theoretical and highly practical experienced based training and 330+ hours of study and practice that is done in the students own time, consisting of core text book reading, case studies (practice hypnotherapy sessions with friends and family which are then to be written up with supervision given by trainers), book reviews, assignments and keeping a reflective personal journal. Students are also encouraged where possible to meet up with fellow students for practice sessions in between modules. A comprehensive training manual will be supplied to all students in hard copy which will be broken down into modules offering all of the information that will be covered throughout the course. Each module's course material will be handed out at the commencement of each module. This course includes both practical (practice sessions in pairs and trios with other students between sessions) and academic work with assignments and case studies to be completed and handed in for assessment. It will be necessary to achieve a pass mark in order to receive your diploma and become accredited as a qualified hypnotherapist. On successful completion and qualifying as a Holistic Hypnotherapist, students will be able to join the General Hypnotherapy Register (GHR) the UK’s largest hypnotherapy organisation. Once accepted by the GHR (and membership fees have been paid) students will receive their membership certificate and will also be able to use the initials GHR Reg. Once qualified and registered with the GHR as a practitioner, you will also be able to register with the CHNC, The Complementary and Natural Healthcare Council. During the training students will also be eligible to join the General Hypnotherapy Register as student members, the UK’s largest hypnotherapy organisation. On successful completion of our inclusive ‘Stop Smoking Campaign’ students will also achieve advanced stop smoking techniques that will allow them to also register with the GHR as a Stop Smoking Therapist. After students have met the requirements to register with the GHR as practitioners they will then automatically be able to register with the CNHC (Complementary & Natural Healthcare Council). We limit the number of places available to students for each course so that students receive personal individual attention to assist in fast tracking their experiential and theoretical learning to becoming skilled practitioners. Practical elements around setting up and starting your own hypnotherapy business are covered in detail to enable our students to get started straight away. We encourage students to write and produce their own scripts and to work more intuitively through understanding the processes involved in parts therapy and inner child therapy. Regression therapy is also incorporated into the course through its application in age regression and regressing to the source of an issue. This is an extremely effective and fast technique to use with clients for a variety of life spoiling issues. Results can be instantaneous and permanent which is highly fulfilling to both the client and therapist. A comprehensive training manual will be supplied to all students in hard copy which will be broken down into modules offering all of the information that will be covered throughout the course. Each module's course material will be handed out at the commencement of each module. This course includes both practical (practice sessions in pairs and trios and with other students between sessions) and academic work with assignments and case studies to be completed and handed in for assessment. It will be necessary to achieve a pass mark in order to receive your diploma and become accredited as a qualified hypnotherapist. During the training students will be eligible to join the General Hypnotherapy Register as student members, the UK’s largest Hypnotherapy Organisation. Once accepted by the GHR (and membership fees have been paid) students will receive their membership certificate and will also be able to use the initials GHR Reg. Once qualified and registered with the GHR as a Practitioner, you will also be able to register with the CHNC, The Complementary and Natural Healthcare Council. 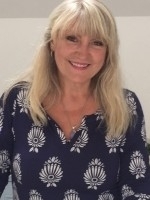 For the last 7 years Hazel and then Trace have been teaching and supervising Hypnotherapy and Regression Therapy with one of the world’s pioneering schools of Regression Therapy.